If spotted, they flee from prey in a zigzag. Their powerful hind legs can reach speeds of up to 18 mph (29 kph). 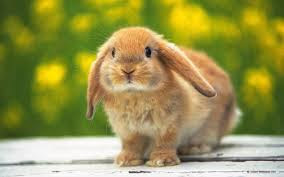 Rabbit ears can be as much as 4 inches (10 cm) in length. They use their ears to detect predators in their habitat. The World’s Largest Rabbit named “Darius” weighs approximately 50 pounds and is currently 4 feet, 3 inches. Although this might sound unbelievable, “Darius” is indeed a real rabbit that currently lives with its owner Annette Edwards from the UK. It has been reported that Darius thinks he is a dog. In the wild some female rabbits can produce about eight litters of bunnies per year. The largest litter of bunnies every reported consisted of 24 kits. Rabbits are natural runners and can reach speeds of up to 30 to 40 mph. Domesticated rabbits that people raise do not open their eyes until they reach about 2 weeks of age. Baby domestic rabbits are actually born fur-less. The World’s oldest rabbit on record lived to be 16 years old. The average lifespan of a domesticated rabbit is around 5 to 8 years. Pet rabbits generally live longer than rabbits used for production and those living in the wild. With the right guidance rabbits can be trained to live indoors perfectly. In the UK the rabbit is the third most popular pet option. It is estimated that over 2 million U.S. households own a pet rabbit. Thousands of rabbit shows take place annually in the Continental United States alone, each year. Male rabbits are referred to as “bucks” and female rabbits are referred to as “does”. Believe it or not, a rabbit’s teeth never stop growing throughout its life. Rabbits can jump up to 36 inches or higher. In general rabbits are very clean animals that will groom themselves and even each other. Rabbits breed at least three to four times a year. Litters of three to seven young are produced. Baby rabbits are called kits and are born blind as well as hairless. Tularemia, or rabbit fever, can be spread from rabbits, raccoons, skunks or other small mammals. Rabbits and hares may look alike but they are two different species. The biggest difference between the two is what their babies look like at birth. Newborn hares are born with fur and are able to move as well as see shortly after birth. Rabbits have a near 360-degree vision and can even see behind them. They have just one blind spot right in front of their nose. Rabbits are popular in mythology and culture. Many people believe carrying a rabbit’s foot will bring good luck. Rabbits reproduce very quickly. This can be a major headache for people living in agricultural areas where rabbits are seen as pests.